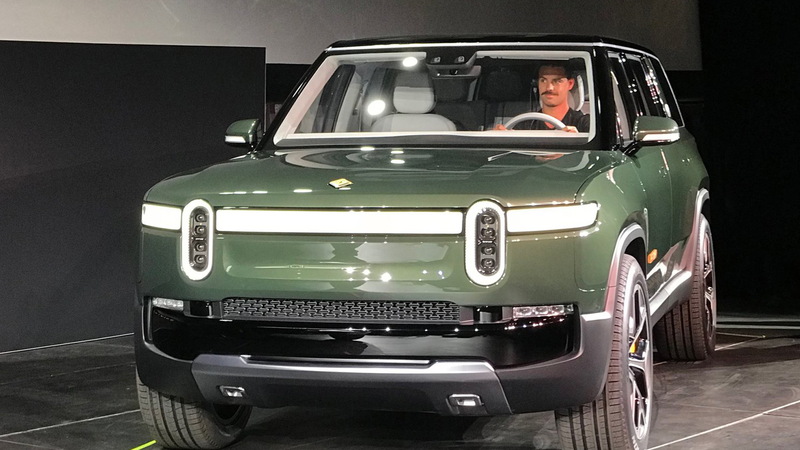 Rivian is gearing up to take on the Tesla Model X with a family-sized SUV of its own called the R1S, which the American electric car startup revealed Tuesday. And unlike the egg-shaped Tesla, Rivian's R1S features a rugged, almost utilitarian look that should appeal to SUV buyers with more traditional tastes. The R1S is related to Rivian's R1T pickup truck unveiled on Monday. 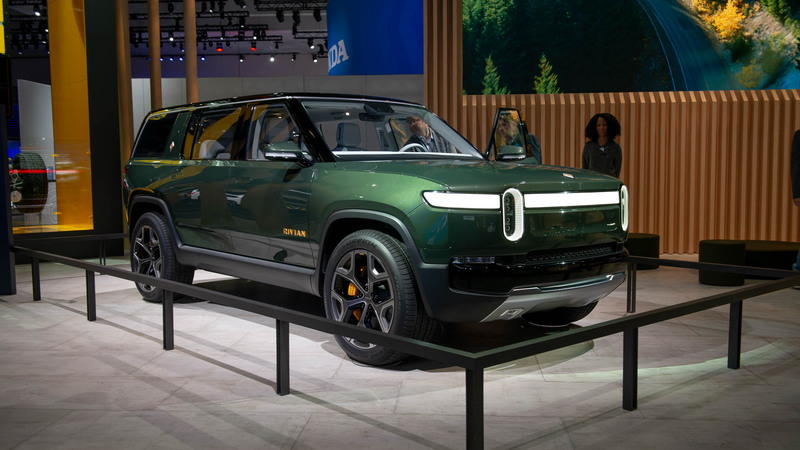 Rivian aims to start deliveries of the R1T in late 2020 and the R1S early the following year, with the starting prices coming in at $69,000 and $72,500, respectively. Pre-orders, which require a $1,000 deposit, are already being accepted. Both vehicles are designed around a flat, skateboard-style platform with the battery in the floor and a pair of electric motors featured at each axle, and the R1S with its standard third row boasts a total seven seats versus the five of the R1T's crew cab. Rivian plans to offer three battery options with capacities of 105, 135 and 180 kilowatt-hours, respectively. The two larger options are expected at launch, with the 135-kwh battery estimated to deliver a range of over 310 miles and the 180-kwh battery a range of over 410 miles in the R1S. The SUV will also offer around 750 horsepower and 820 pound-feet of torque with the bigger batteries. The 105-kwh battery is estimated to deliver over 240 miles of range, though with this battery the output from the motors will be dialed down to around 400 hp and 413 lb-ft—still impressive numbers for a family SUV. All that power coupled with the instantaneous torque of the electric motors means the R1S will fly off the line when you put your foot down, even with its curb weight registering around 5,840 pounds. Rivian says the more powerful models should hit 60 mph in 3.0 seconds. The top speed is limited to 125 mph and the trailer weight rating is 7,716 pounds. When it comes to charging, Rivian has designed its batteries to handle charging rates of up to 160 kilowatts. This enables approximately 200 miles of range to be added in 30 minutes, according to the company. Rivian is yet to announce whether it has a supplier for its batteries or will manufacture them in-house. Beyond the electric powertrain, the R1S is loaded with goodies to ensure it is also a thouroughly capable SUV. An example is the sophisticated suspension architecture with unequal length double wishbone suspension in the front and a multi-link suspension in the rear. The suspension features dynamic roll control and adaptive dampers along with ride-height adjustable air-suspension. The rear of the R1S features a liftgate and small tailgate, with the tailgate providing an area to sit. The second and third rows fold flat to provide room for extra gear. For even more storage, Rivian has developed a racking system that utilizes telescoping racks with mounts that quickly attach to the roof. When not in use, racks can easily be stored in the front trunk of the vehicle. Inside, there is a clean, uncluttered look to the dash. 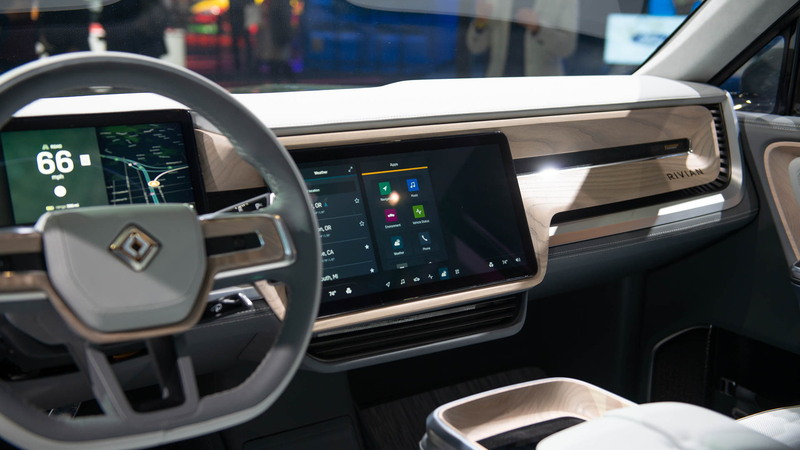 Wood is used throughout the interior, including as a structural element that integrates the main center display and driver cluster. 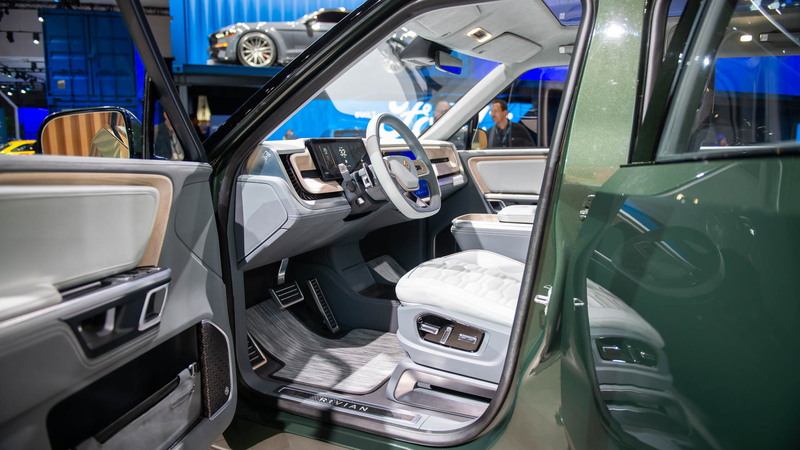 Rivian says its designers took inspiration from contemporary furniture, as well as hiking and outdoor gear, when working on the cabin. Safety features include eight airbags along with reinforcements of the chassis to protect the battery. 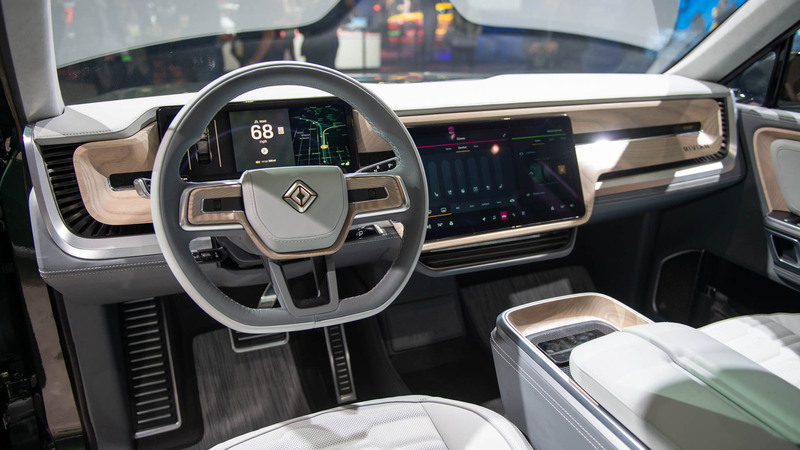 The R1S will also be offered with a full complement of electronic driver aids, including a self-driving system that Rivian says will be Level 3 capable on the highway. Level 3 means the driver can look away briefly but needs to be ready to take over at a moment's notice. It seems like an electric car startup surfaces every other day, but there's reason to take Rivian a bit more seriously than most. Instead of making bold promises that get pushed back or completely fail, Rivian has been working diligently in the background on its electric car plans for several years, including securing a production site in the form of the old Mitsubishi plant in Normal, Illinois. Rivian will present the R1T and R1S at the 2018 Los Angeles auto show, which starts Wednesday. For more coverage on the show, head to our dedicated hub.